First my news--publication is imminent for a couple of my stories. I will post about that separately. The topic for now: I am also freshly back from the 2018 Eurocon which took place this year in Amiens, France. I was born in France and I spent considerable time there in my teens but I haven't been back for several years, and until this trip I'd never really been to the north of the country. Even in the north it was still quite warm--one pharmacy thermometer I'm not certain I believe said 37 Celsius--and the heat did impact on the feel of the event. Certainly it was quite well-attended, with over 400 memberships sold, and I had a good and relaxing time once I got there. Before I continue: over the past few days while I was traveling a couple of issues with the upcoming Worldcon 76 in San Jose have emerged, namely the misgendering of some featured members, the misuse of some members' personal information, a lack of respect for members of color and LGBT members in programming decisions, a certain quite haughty attitude regarding dress code...we don't have a full picture but friends of mine who are attending (I can't) are responding by taking steps like withdrawing themselves from the program. Moreover French fans are bidding to host the 2023 Worldcon, and for both selfish and unselfish reasons I favor this bid over New Orleans's. So I am going to try to be constructively critical of the Eurocon--which, again, I enjoyed--because I want future big events to be as fun for everyone as possible. I say that things were relaxing in Amiens when I got there because there was a harrowing element to the trip, namely, the means for collecting room keys was unclear. The train I'd booked for Amiens turned out to mostly be a bus that got in at 20.00, and the Con webpage surprised a lot of us by saying room keys would only be available until 18.30. Unfortunately one hallmark of Eurocon 2018 was this lack of communication: we didn't get progress reports (they exist, but weren't e-mailed out), when we bought meals or booked rooms through their site our only documentation was the PayPal receipt, and as I found while panicking en route from Paris, they weren't replying to queries to their e-mail or on Facebook. Everything turned out okay, and the feeling of traveling while not being completely sure arrangements would work out at the destination did have a quite 1990s feel to it, but I would urge future big events: have a point person or persons on the day covering queries and able to respond promptly. 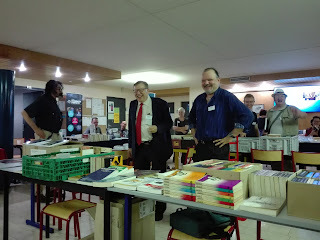 Most of Eurocon 2018's programming was in French, which luckily I speak reasonably well. Something which impressed me was the clear literary orientation of the whole thing. This was the biggest single bit of French character about the whole event. France famously has high regard for books--Valery Giscard d'Estaing took time out to appear on book talk show Apostrophes while he was in office! There was, looking through the program again, exactly one item that was explicitly not about printed media: a showing of films from the first decade of the 20th century. I am not at all complaining about this! In fact, I think an accessible yet academic approach to literature is something conventions could benefit from more. I was particularly interested to hear for the first time about the merveilleux-scientifique genre, which existed in parallel to early science fiction around the time of Verne and Wells. To mention Verne and Wells together is to evoke another highlight of the program, the original play Goodbye, Mr. Verne, which depicts a fictional lunch conversation between those two authors at a time when Verne was aging and famous and Wells was a young fan just starting out. The play was run twice, once in English and once in French, and, once it built up its momentum was a neat hour and a half of thoughtful entertainment. It came with considerable weight behind it: Galaxies editor Paul Gevart was the playwright, and Ian Watson the translator to English. The question of translation is becoming a key issue in European conventions. A national convention will, of course, want to cater to its core membership by presenting its items in the national language: Finncon in Finnish. At the same time, as fandom becomes more and more internationalized, English has, as it has elsewhere, become the common tongue. The ideal choice would seem to be to run simultaneous translation for every event, so the audience can experience it all in their most familiar language. Eurocon 2018's experiment in simultaneous translation, though, could have gone better. The quality of the program item translation was not an issue at all: well-established translator Thomas Bauduret was on hand. The issue was that M Bauduret would appear at the beginning of an English-language item unscheduled and offer translation, and if he was engaged then, by the simple nature of the beast, all the discussion that followed would move at half-speed, and a panel which was planned for 45 minutes suddenly had ninety minutes of material. This issue of timing ran throughout Eurocon. Perhaps, having mostly attended either US conventions or things in the Nordic countries, I've become overly habituated to the appearance of a gopher holding up a "STOP" card to make sure the program ran to schedule. There was no such provision at Eurocon, nor did the program participants often feel a great need to follow the schedule closely. There were only four program rooms, but all it takes is one person claiming their 67 minutes of their allotted hour--and there were far more than one doing this--and the entire schedule becomes gummed up. Sometimes it can even look really bad for the convention. 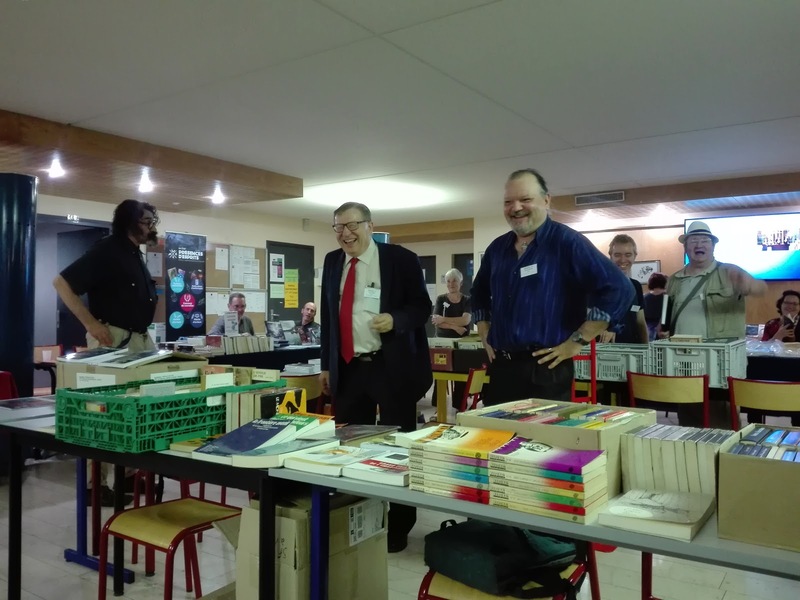 I need to preface again: Eurocon 2018 put African SF discussions at the center of its programming, made a point of having African authors on hand, and this is a superb thing to focus on given many factors. The first expression of this track, though, was a presentation about African SF given by a white Canadian, Geoff Ryman, who overran, in large part due to the surprise simultaneous translation; and an immediate consequence of this running over was that the following program item, a talk introducing Afrofuturism by Black SF author Yann-Cédric Agbodan-Aolio, started late and was cut short. I'm not for one second claiming any sort of negative intent by the Eurocon organizers, but mindful of how things are going with Worldcon 76 I think it is important to emphasize the importance of elevating marginalized voices, and being seen to help elevate them. I saw a couple of program items that were about African writing, where African authors were on hand, but where organizers had chosen all-white or all-European/North American/Australian panels. Lunch is served. My god, is it served. I know, I sound like I'm complaining about everything. I enjoyed the food at Eurocon immensely. I think a lot of people were skeptical about the idea of Restaurant Universitaire lunches and dinners but what we were presented with was usually superb, with something along the lines of roast beef and green beans as a main course, unlimited wine at both lunch and dinner, cheeses and tarts for dessert, all included in the meal ticket (a PDF of the menus is here). The content, quality and value for money were excellent--but note the lack of vegetarian or vegan options. Again, this is an area where I may have become jaded. In Finland, so much of the population is some kind of vegetarian that no-animal options are widely available, and I know that in France not too long ago when you asked for "no meat" the response would often be to offer you chicken. Amiens is a small university town, and it has a small town feel. Nonetheless I was impressed by the variety of cultural options and the rousing nightlife. 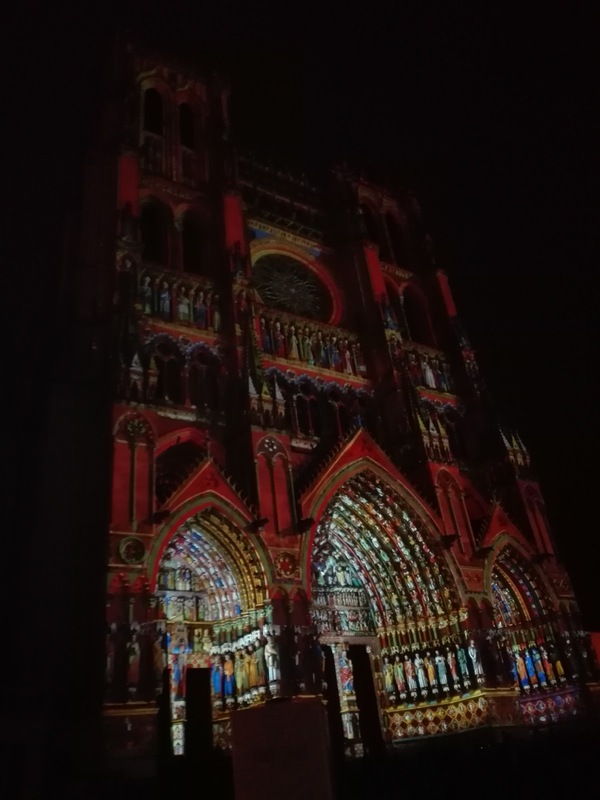 The illumination of Amiens cathedral created an installation which I, who am usually allergic to cathedrals, found transfixing. I am glad to have gone and while I don't think I can make the 2019 Eurocon in Belfast I'm already looking forward to 2020 in Rijeka. A warming supplement to the whole weekend was the European Science Fiction Association's naming of Jukka Halme to its Hall of Fame for his role as chair of Worldcon 75. Having worked for Jukka I can attest to his leadership and calming influence and his contributions and experience played a large part in making W75 the fun, accessible, international event it was. In the spirit of that, I can say I enjoyed the 2018 Eurocon and I hope fans in France and elsewhere will also see the event as a success in terms of its attendance and content. I hope also there will be the recognition that with some polish, with more organic attention to representing the diversity of the SF community and the to centrality of elevating marginalized voices in and through the genre, future events in Europe can become truly superb and be recognized as so worldwide.